We are a family business working year round in East Glacier Park, Montana, at the base of the Rocky Mountains, on the Blackfeet Reservation. Because each of our spoons is an original work of folk art, no two of them are ever exactly alike. Each spoon that we sculpt is an adventure. For all the care and planning that goes into a design, they often surprise us and design themselves. Jo carved her first spoon in 1997 and sold the first one in 1998, shortly after she and Charley moved to Montana. 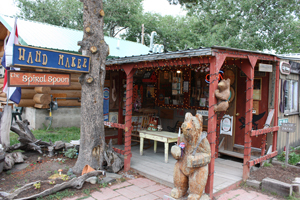 Since that time, the shop in our front yard in East Glacier Park has grown as have the spoon sales. Everything that Jo knows about carving has been completely self-taught, and the process that she uses has developed out of many trials and errors. In 2003, Jo’s husband Charley decided that what she was doing was more than just a hobby, so now he helps with the spoons full time. Charley’s daughter, Amber, joined the business in April of 2010, and we are now able to offer a limited number of our spoons on our online web store. We first carve the spoon then sand it smooth. Because water raises the grain of sanded wood, the spoon is then “water cured” at least three times. That is, we soak the spoon in water and allow it to dry. We then sand it with increasingly finer grits, between soaking and drying, until the grain no longer rises when the wood is wet. The final polishing is at a 600 grit so that the spoons remain smooth after use. All of our spoons are finished with Spiral Spoon Snake oil, our own blend of mineral oil and beeswax. The mineral oil penetrates the wood and helps to preserve it while the wax seals and protects the wood, keeping it from feeling oily to the touch and additionally repelling water.